Fisher's Popcorn was founded by Everett Fisher in 1937. He developed a world class recipe for delicious buttery caramel popcorn that has remained unmatched almost 80 years later. 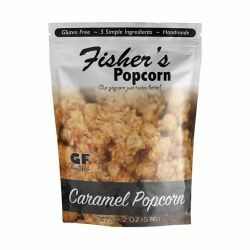 Today, Fisher's Popcorn continues to make delicious caramel popcorn by hand the same way it was in 1937. Super delicious. Pick the traditional Caramel or for a sweet and salty taste, try the Caramel dusted with Old Bay seasoning.